SqlBulkCopy class is used to bulk copy data from different data sources to SQL Server database. This class is present in System.Data.SqlClient namespace. This class can be used to write data only to SQL Server tables. However, the data source is not limited to SQL Server, any data source can be used, as long as the data can be loaded to a DataTable instance or read with a IDataReader instance. From a performance standpoint, SqlBulkCopy makes it very easy and efficient to copy large amounts of data. We want to load the following XML data into SQL Server database. 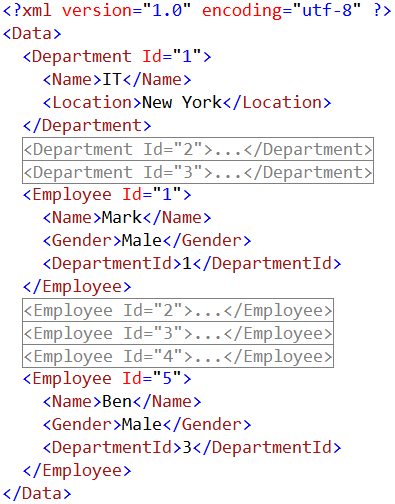 Notice that we have Departments and Employees data in the XML file. We would like to load Employees data into Employees table and Departments data into Departments table. After the data is loaded, the database tables should look as shown below. 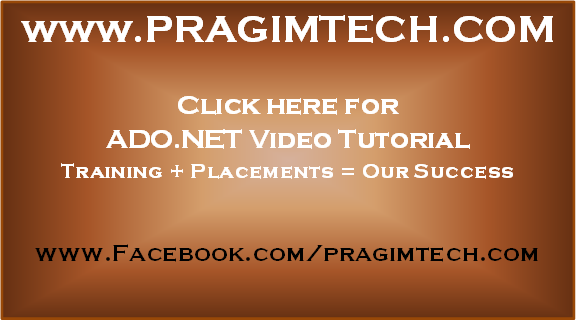 Step 2 : Create a new empty asp.net web application project. Name it Demo. Step 3 : Add a new xml file to the project. Name it Data.xml. Copy and paste the following XML. Step 5 : Add a new WebForm to the project. Drag and drop a button control on the webform. Double click the button control to generate the click event handler. Copy and paste the following code in the the click event handler method.